We are excited to let our readers know that Correos has issued a Premium Sheet celebrating the strength of Spanish traditions; in this case, traditional dances. The Sheet is presented as a die-cut guitar shape, and when opened, plays a traditional Spanish melody. It is decorated with an illustration of dancers’ legs in traditional stockings and espadrilles. 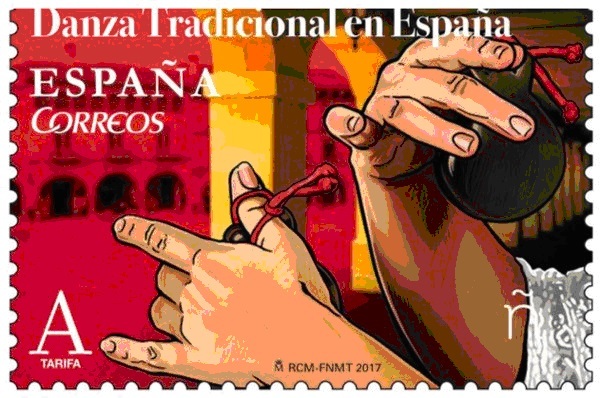 The stamp is dedicated to “crotacología”, or the art of playing the castanets. It depicts this percussion instrument being used in traditional Spanish dances. The stamp’s background shows the colours of the Spanish flag – red and yellow. There is a wide variety of traditional local dances in Spain. Although many of them share a common origin (similar steps or moves), each autonomous region, city or town usually has its own unique dance. Sones in Extremadura, Sevillanas in Andalusia, Jotas in Aragon, Pericotes in Cantabria, Seguidillas in Castile-La Mancha and Castile-Leon, the Sardana in Catalonia, the Chotis in Madrid, Zortzicos in Navarre, Moixigangas in the Region of Valencia, the Muñeira in Galicia, Copeos in the Balearic Islands, the Danza de los Palos in La Rioja, the Aurresku in the Basque Country, the Corri-Corri in Asturias and Parrandas in Murcia, are just a few examples of the wealth of dances to be found in Spain. There are so many more it would be impossible to list them all here.